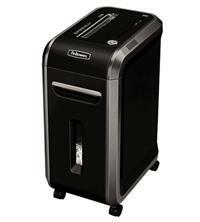 The Fellowes Powershred 99Ci is a cross-cut office shredder that shreds up to 17 sheets at a time. It is suitable for between 3-5 users and shreds paper into 4 x 38mm pieces with a P-4 security rating (suitable for highly confidential material). The shredder will also shred a number of different material types including paper, credit cards and CDs/DVDs. It will also shred staples and small paper clips, so there is no need to remove these before shredding. The Fellowes Powershred 99Ci comes with a number of handy features including: SafeSense Technology which immediately stops the shredder if hands touch the paper opening; a 100% Jam Proof system which prevents paper jams and powers through misfeeds and tough jobs; SilentShred which minimises noise, especially useful for a shared work environment; a safety feature whereby the shredder will not run if the waste bin is open; an extended run time of 25 minutes to help process high volume shredding tasks; an Energy Savings System which switches the shredder to standby mode after periods of inactivity; an overheat indicator; and castors to make transportation easier. The 34 litre bin is pull-out for easier emptying and there is a bin full indicator to let you know when you need to change it.